Throughout his distinguished career, Marvin Stamm has been praised for both the art and the craft of trumpet playing. Leonard Feather stated that "Mr. Stamm is an accomplished performer whose technical skill is used as a means to stimulating original ends." While attending North Texas State University, a school noted for its innovative lab bands, Mr. Stamm was discovered by Stan Kenton. Upon graduating, he performed with the Kenton's orchestra as his jazz trumpet soloist 1961-1962, recording five albums with the orchestra. In 1965-1966, he toured worldwide with Woody Herman. Marvin Stamm settled in New York City in late 1966, quickly establishing himself as a busy jazz and studio trumpeter. New York was bustling with jazz activity during that period, and Stamm performed at key venues with many of the significant players in the business. He gained considerable recognition for his playing with the Thad Jones/Mel Lewis Jazz Orchestra (1966-1972) and the Duke Pearson Big Band (1967-1970), as well as performing with Frank Sinatra (1973-1974) and the Benny Goodman Sextet (1974-1975), among others. Stamm was also a recognized first-call studio player (1966-1989). Some of the jazz artists with whom he recorded include Bill Evans, Quincy Jones, Oliver Nelson, Duke Pearson, Thad Jones, Wes Montgomery, Freddie Hubbard, Stanley Turrentine, Patrick Williams, Michel Legrand, Lena Horne, Frank Foster, Paul Desmond, George Benson, and many other popular artists of the period as well. Eschewing the lucrative studio scene in the late 80s, Mr. Stamm has focused his attention on his first love, playing jazz. 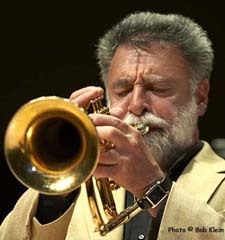 Over his career, he has been a member of John Lewis' American Jazz Orchestra, the Bob Mintzer Band, the George Gruntz Concert Jazz Band, Louis Bellson's big band and/or quintet and, on a number of occasions, performed with the big band of composer Maria Schneider. Currently, Mr. Stamm spends much of the year touring. His activities include performing as a soloist, touring with his jazz quartet, and playing in duo with pianist Bill Mays. Stamm and Mays recently formed and are touring with a new group, the Inventions Trio, which includes cellist Alisa Horn. Stamm performs with symphony orchestras throughout the country and maintains his ties with the George Gruntz Concert Jazz Band. At home, Mr. Stamm participates and performs with the Westchester Jazz Orchestra, a big band made up of some of the finest jazz musicians in the New York area, all living in Westchester County. Led by composer/arranger Mike Holober, the band includes trumpeters Tony Kadlack, Craig Johnson, Marvin, and Jim Rotondi; trombonists Keith O'Quinn, Larry Farrell, Bruce Eidem, and George Flynn; saxophonists Jay Brandford, David Brandom, Ralph Lalama, Jason Rigby, and Eddie Xiques; pianist Ted Rosenthal, bassist Harvie S, and drummer Andy Watson. Marvin Stamm's first solo album, Machinations, was composed and arranged by jazz legend, John Carisi. After touring for several years with Frank Sinatra, Marvin recorded Stammpede in 1982, an album heralding his rededication to a solo jazz career. In 1991, Stamm released Bop Boy, a quintet CD featuring tenor saxophonist Bob Mintzer, drummer Terry Clarke, pianist Phil Markowitz, and bassist Lincoln Goines. A follow-up, Mystery Man, was released in 1993, again featuring Mintzer and Clarke, but this time in the company of pianist Bill Charlap, bassist Mike Richmond, and saxophonist Bob Malach. In November 2000, Mr. Stamm released two new CDs on his newly-formed Marstam Music label. The first, a duo CD, By Ourselves, documents Stamm's long-time collaboration with pianist Bill Mays. The second CD, The Stamm/Soph Project, is a quartet setting created with drummer Ed Soph that features bassist Rufus Reid and pianist Bill Mays. Saxophonist Dave Liebman guests on three tracks. Both CDs garnered excellent critical response. November 2001 saw the release of Elegance, a quartet CD featuring the remarkable young pianist from Sweden, Stefan Karlsson, along with bassist Tom Warrington and drummer Eliot Zigmund. In March 2005, The Stamm/Soph Project - Live at Birdland was released on the JazzedMedia label. Again co-led with Ed Soph, this CD also features Stamm's working quartet with long-time bandmates pianist Bill Mays and bassist Rufus Reid. Guitarist John Abercrombie guests on four tracks. Recorded in the famous New York City jazz club, this CD showcases the quartet in "live" performance rather than a studio setting. Stamm says, "Working with these musicians as a group - Ed, Bill, and Rufus - always produces very special moments. None of us takes these events for granted or looks upon them as just another gig. Each of us really comes to play!" For me, performing with this group is a pinnacle of sorts because these are the guys with whom I want to play; they are my choice!" Three recordings were released in 2007: Alone Together, a DVD/CD set, featuring his quartet with pianist Bill Mays, bassist Rufus Reid, and drummer Ed Soph; Fantasy, the first recording by the Inventions Trio, released on Palmetto Records; The Nearness of Two, a duo performance of Mr. Stamm and pianist/vocalist Dena DeRose, recorded "live" at the Ancona Jazz Festival in Ancona, Italy. In September, 2008, the Inventions Trio released its second CD, The Delaware River Suite. The critical response to Stamm's work has been highly enthusiastic. Downbeat reported that "Stamm has a gorgeous tone on the trumpet and flugelhorn, and he flies through the changes". JazzTimes said that "the Memphis native has chops and talent in abundance. He can burn on bebop changes, or mellow out on a ballad, all the time maintaining the lucid consistency that enthusiasm and experience engenders." Jazz Review states, "It is a pleasure listening to the work of Marvin Stamm, anytime! Stamm is a musician's musician, performing flawlessly on his trumpet and flugelhorn." Consciously acknowledging his debt to the influence and guidance of former teachers and fellow musicians, Marvin Stamm also commits a good deal of his time and energies to helping young music students develop their own voices. His involvement in jazz education takes him to universities and high schools across the U.S. and abroad as a performer, clinician and mentor, perpetuating the traditions of excitement and innovation that jazz represents.